The BC SPCA is committed to achieving the highest standards of transparency and accountability in all its activities, which has resulted in several awards and accreditations. Since 2013, the British Columbia Society for the Prevention of Cruelty has been among the elite group of Canadian organizations accredited by Imagine Canada, the national umbrella for charities and nonprofits. Imagine Canada accredits organizations using a Canada-wide set of shared standards designed to demonstrate compliance in five fundamental areas: financial accountability and transparency; board governance; fundraising; staff management and volunteer involvement. The BC SPCA receives an “A” rating and is among the top 10 charities in MoneySense magazine’s 2019 survey that rates 100 Canadian charities for overall efficiency, transparency and donor stewardship. The BC SPCA is rated as one of the top charities in MoneySense magazine’s 2018 survey that rates 100 Canadian charities for overall efficiency, transparency and donor stewardship. The BC SPCA receives four stars – the highest rating possible – in Charity Intelligence Canada’s annual list of top charities. The BC SPCA is rated as one of the top charities in MoneySense magazine’s 2017 survey that rates 100 Canadian charities for overall efficiency, transparency and donor stewardship. 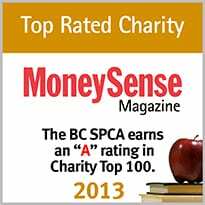 The BC SPCA is among the top 20 charities in MoneySense magazine’s 2016 survey that rates 100 Canadian charities for overall efficiency, transparency and donor stewardship. The BC SPCA is one of only 18 Canadian charities to earn an A+ – the highest overall rating – in MoneySense magazine’s 2015 survey that rates 100 Canadian charities for overall efficiency, transparency and donor stewardship. The BC SPCA is one of only 12 Canadian charities to earn an A+ – the highest overall rating – in MoneySense magazine’s 2014 survey that rates 100 Canadian charities for overall efficiency, transparency and donor stewardship. The BC SPCA earns an “A” rating for overall efficiency, donor stewardship and transparency in a survey of 100 Canadian charities by MoneySense magazine. The BC SPCA received Imagine Canada accreditation and is the only Animal Welfare Organization in Canada to achieve this status. 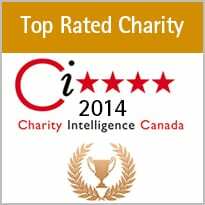 Charity Intelligence Canada names the BC SPCA one of its top charities for 2012. The BC SPCA was one of 45 charities, and one of only two animal welfare organizations, selected in the top 2012 picks. 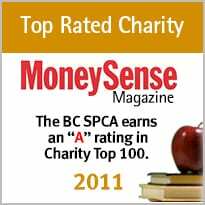 The BC SPCA is one of only six Canadian charities to earn an A+ – the highest overall rating – in MoneySense magazine’s 2012 survey that rates 100 Canadian charities for overall efficiency, transparency and donor stewardship.